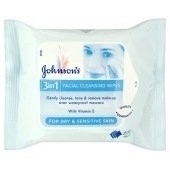 3 in 1 facial cleansing wipes. Aqua, Glycerin, Cyclopentasiloxane, Isononyl Isononanoate, Pentaerythrityl Tetraethylhexanoate, Isostearyl Palmitate, Cetyl Ethylhexanoate, Hexylene Glycol, Stearyl Ethylhexanoate, PEG-6 Caprylic/Capric Glycerides, Tocopheryl Acetate, Sucrose Cocoate, PEG-4 Laurate, Carbomer, Ethylhexylglycerin, Sodium Hydroxide, Dehydroacetic Acid, Phenoxyethanol, Benzoic Acid, Iodopropynyl Butylcarbamate, Polyaminopropyl Biguanide, Parfum. Easy to use, works well. Easy to use, easy to store and can carry about everywhere. Really gentle wipes that leave skin feeling fresh and clean. Does everything it claims to do and at a good price. Removes all make up and impurities. these wipes are effective at removing all traces of makeup and are gentle around the eye area. "This is one of my favourite wipes by Johnson’s due to the fact that they do not dry out your skin at all. I have..."